The Cambridge Community Foundation, in partnership with Cambridge Mayor Marc C. McGovern and Somerville Mayor Joseph A. Curtatone, is expanding its immigrant legal defense fund to support individuals who live and work in the Somerville community, as well as Cambridge. The expanded fund has been renamed the United Legal Defense Fund for Immigrants, reflecting the growing need for legal support for immigrants across city borders. By unifying efforts to raise funds for the most vulnerable families in our community, we can help valued neighbors and stabilize families impacted by the stress and uncertainty of ongoing shifts in TPS and DACA status , and those seeking asylum. Funds raised through the United Legal Defense Fund for Immigrants will be distributed in the fall of 2019, to address this urgent need. Many immigrant families, children, and workers in our community are caught up in a humanitarian crisis that is tearing families apart, threatening to deport TPS holders and DREAMers from the only home they have ever known, and exposing asylum seekers to the persecution and abuse they faced in their home countries. Help us help our most vulnerable neighbors in Cambridge and Somerville with a tax-deductible contribution to the United Legal Defense Fund for Immigrants. One in four immigrants in America are undocumented. Pew Research Center data states 250,000 undocumented residents are in Massachusetts, an increase of 35,000 residents between 2019 and 2017, of which over 180,000 are in Cambridge, Boston, Somerville, and surrounding communities. In Massachusetts, there are approximately 19,000 students eligible for DACA status, over 12,000 are workers with Temporary Protective Status, thousands more are asylum seekers. 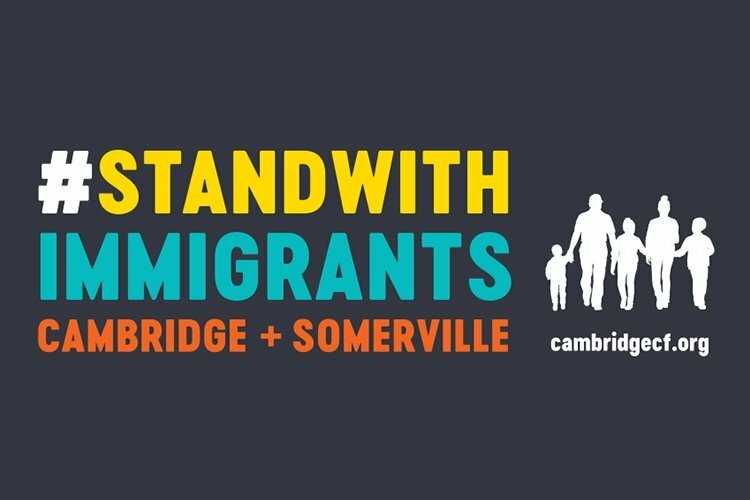 While there is no city-specific data on the numbers of undocumented immigrants in our community, proxy data shows 27% of the population in Cambridge is foreign born. 25% of Somerville’s population are immigrant residents. In Cambridge, approximately 40% of children have at least one foreign born parent. In Somerville, 49% of students in the local school district have a first language other than English. Currently, only 37% of all immigrants and 14% of detained immigrants go to court accompanied with a lawyer. Deportation proceedings are considered civil matters, so lawyers are not provided by the court. Those with legal representation have a five times higher chance of achieving a favorable outcome. · Provide family legal services to support Temporary Protected Status (TPS) workers. The expanded United Legal Defense Fund for Immigrants is the next step in an incredible grassroots effort that has drawn more than 300 local residents to support our most vulnerable neighbors. In the fall 2018, six months after the launch of the original fund, the CCF distributed $255,000 in two-year grants to legal assistance organizations that support local immigrants, including De Novo (formerly Community Legal Services and Counseling Center (CLSACC), Greater Boston Legal Services, and Irish International Immigrant Center (IIIC). We also distributed a grant to Political Asylum Immigration Representation Project, Inc. (PAIR). · $200 medical exam: Immigration proceedings require medical examinations performed by a civil surgeon who has been designated by USCIS. This is not paid by the court. · $465 DACA fee: The fee covers first time and renewal applicants of Deferred Action for Childhood Arrivals (DACA). The cost of the application has been one of the major barriers to the DACA program. · Translation costs: Immigrants may need translation services, and pro-bono attorneys don’t necessarily provide them. · $6,000 for Asylum: It costs approximately $5,000 to $6,000 in attorney fees for a single client to get through the Asylum process. · The Asylum process requires 70 to 120 hours of legal work. · To help one youth gain special immigrant juvenile status requires 50 to 70 hours of legal work. · To help one victim of trafficking requires 40 to 80 hours of legal work. While names have been changed to protect privacy, these are just a few real stories of real people in our community who are currently navigating this process with legal assistance. David, a graduate of Cambridge Rindge and Latin School and former director of the Boys and Girls Club in Somerville wasn’t a legal resident because he was brought to the United States at a young age. David realized how vulnerable he was when he was detained by U.S. Customs and Border Protection agents in New York state because he didn’t have his citizenship papers. Through pro-bono legal assistance in Cambridge, David, a DACA recipient, has successfully renewed his work authorization for another two years. Ama, a young woman from East Africa, suffered abuse at home, was told at the age of 13 that she had to marry a man, 20 years her senior. She fled to the United States and applied for Special Immigrant Juvenile status, a form of legal relief available to child survivors of abuse, abandonment or neglect. Maria fled Honduras with three young daughters to escape the abuse of her husband as well as gang violence. With just a few personal items and $27 in cash, they crossed through Guatemala, then into Mexico, where they were abducted by two Zetas who beat Maria for two weeks and demanded thousands of dollars for their release. Maria and her girls escaped, reached the U.S. and are now seeking Asylum protection so she can gain a work permit and build a new life. Sandra was violently attacked at work but too afraid to talk to the police for fear of deportation and the risk of leaving her young daughter, a U.S. citizen, behind. Even though she’d worked in the area for more than 10 years, she had no path to obtain legal permanent residence. Then came the attack, which resulted in panic attacks and depression and ultimately led her to a legal aid organization to get help. Sandra is filing for a U Visa, a protection to victims of crime who cooperate with law enforcement. More dollars mean more resources for threatened immigrants. Make your tax-deductible gift now. Please make checks payable to Cambridge Community Foundation for United Legal Defense Fund for Immigrants and mail to 99 Bishop Allen Drive, Cambridge MA 02139 or donate online .